Celeste Barber soloed on the Pledge of Allegiance at the January 24 board meeting for Santa Barbara City College, igniting support from national conservative media. Santa Barbara City College has called in the Santa Barbara Police Department to advise the campus regarding the “considerably high volume” of “hostile” phone calls, emails, and social media messages the college has been receiving. SBCC was inundated with calls after national news outlets reported that Board of Trustees President Robert Miller decided earlier this year that the Pledge of Allegiance would no longer be recited at its meetings. Many of the messages “could be interpreted as hostile in nature,” the college said. On Monday, Miller announced the pledge will be temporarily reinstated until the board discusses the matter at a future meeting. At last Thursday’s meeting, former City College instructor Celeste Barber and two other women asked the trustees to reinstate the pledge. 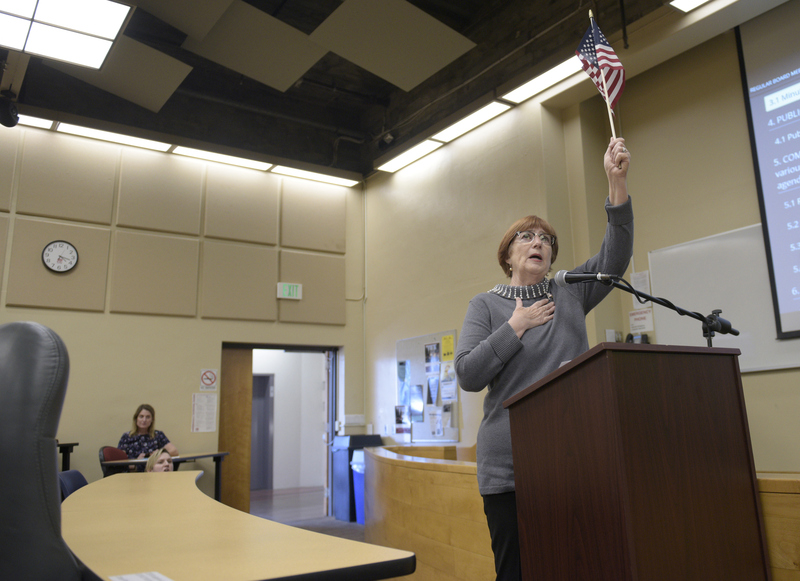 Barber concluded her public comments by reciting the pledge while holding an American flag, during which she was heckled by students and faculty members, who were attending the meeting to protest the return of Vice President of Business Services Lyndsay Maas to campus. Maas, in a separate controversy, had been placed on unpaid leave after she used the unabbreviated n-word during a gender and equity meeting. The story about the pledge and Barber’s heckling was picked up and reported by Fox & Friends, Breitbart News, and other conservative media outlets. The students at the meeting were involved with the Umoja program, for African-American and other City College students, and the Center for Equity and Social Justice. Both program offices will be closed this week, “out of an abundance of caution,” the college said. The full board meeting can be viewed here. In an email exchange with Barber, Miller took full responsibility for deciding not to recite the pledge. “I decided to discontinue use of the Pledge of Allegiance for reasons related to its history and symbolism,” he said. Miller goes on to mention his objection to the phrase “one nation under God” and references a Washington Post article about the history and intentions behind the Pledge of Allegiance. “Expressions of support for the Pledge of Allegiance in 1890 sound eerily similar to the ugly racist, anti-immigrant expressions we hear today,” he said. Miller’s decision comes at a time when the college is grappling with accusations of racism on campus. The incident involving Maas galvanized a number of students, faculty, and staff, and has led to an outpouring of criticism over how the campus deals with race-related issues. A second incident involving a college employee allegedly using a racial slur was reported on January 28. The accusation is being investigated. One City College faculty member who asked to remain anonymous commented on the campus climate since the Barber story received national attention. The Welcome Center phones were turned off because of the high volume of harassment calls coming in, the person said. Fellow faculty members have voiced concerns over the safety of students, the teacher added. Editor’s Note: This story was corrected February 1. The article incorrectly stated the pledge matter would be discussed at the Board of Trustees February 14 meeting.